The issue of undocumented Mexican migrants in America is widely reported. But what about the thousands of Americans living illegally south of the border? Mexico Direct looks at why they come, and why Mexicans aren't yet making an issue about it. When Jessica departed the US early in 2011, she left a country where illegal immigration is rarely off the political agenda. Little did she imagine she herself would become an 'alien' - in Mexico. 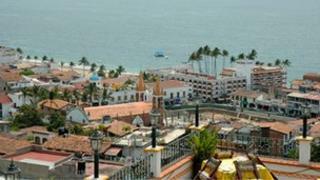 She came to Puerto Vallarta, a tourist resort on the Pacific coast, to work legally for a Mexican company. She took a second job to earn extra money, first in an internet cafe and then a restaurant. But her employers - also Americans - never filled in the paperwork to make her second job legal. "I insisted, but they told me it wasn't necessary, that they would pay me in cash every night and it was fine," she tells the BBC. "It was clearly illegal for me to work there, but I did not take the authorities in Mexico seriously. My employers then found themselves in legal trouble and I feared I could face deportation, so I quit." Last year about 1,000 US citizens were questioned over irregularities in their immigration status, according to Mexican authorities. They face a modest fine - up to $50 - if officials find them working without a permit or living in Mexico without proper documents. Those who lose their visas or are asked to leave the country and then discovered to be overstaying are fined up to $400. But the National Migration Institute in Mexico has no idea just how many Americans are living or working illegally in Mexico. There are no advocacy groups defending American aliens in Mexico. Mexican politicians haven't raised it as a major issue - a far cry from the controversy around illegal migration on the other side of the border. With thousands of people from Central America crossing into Mexico illegally every year, and the threat from drug gangs and human traffickers on their way to the US, the presence of undocumented Americans is considered little more than a minor issue for Mexico's immigration services. No one really knows how many of them there are in Mexico. Some are Americans tourists who decide to extend their stay in Mexico without notifying the authorities, or students who wish to earn extra money teaching English in Mexico City. Others just fall in love with the Latin American lifestyle. "No one really knows how many of them there are in Mexico. They are usually people who live for a while in Mexico and then return home. They do not stay indefinitely," says Monica Mora, an expert on American migration in Mexico. "Nowadays most Americans live legally in Mexico, working as employees of multinational companies for a couple of years here, but also retirees and students," says Mrs Mora, who is a researcher at the National Institute of Anthropology and History. According to the last Mexican census (2010), more than 738,000 people born in the United States now live in Mexico. Some 60,000 of them are living in the country indefinitely, mostly in Baja California in the northwest of the country and in Mexico City. The rest are temporary visitors and legal employees of international companies. Tropical weather, the cheaper cost of living and an exotic atmosphere a few hours from home have drawn curious Americans to Mexico since World War II. They are now the largest foreign group in Mexico, according to official records. Elaine Levin, an expert on international migration, was one of thousands of Americans who emigrated to Mexico 40 years ago. She came legally and now has Mexican nationality. She says the comfortable life of Americans in Mexico contrasts with the persecution and harsh immigration legislation Mexicans have to face in the US. "There havn't been any integration issues here because this has always been part of Mexico's history. Even the ancestors of a candidate for the 2012 Republican Party presidential nomination, Mitt Romney, came to Mexico as immigrants," she tells the BBC. "In fact, Mexico treats 'gringos' much better that the US does Mexicans," Mrs Levin says. There is little public debate about the issue - many Mexicans would be surprised that an American would want to come here and live illegally. The coasts of the Baja California peninsula, the idyllic town of San Miguel de Allende in central Mexico, and villages around Lake Chapala (by the Pacific coast) are favourite spots for retired Americans who come to spend their last years - and their life savings - in Mexico. "It's still to be seen whether the news reports about the drug violence from American networks will have an effect on this," Mrs Levin says. "Some people might think twice before going to some areas, but that hasn't happened yet," she adds. Even though US tourist numbers dropped 6% last year, towns like San Miguel de Allende are still full of American-run businesses and home owners from the US. Some Americans in Mexico are beginning to see a different side of the immigration debate. "I used to live in a large Mexican community, in Chicago. I always knew some of them were illegal and wondered how they could get away with it," Jessica says. She's now legally entitled to stay in the country and is living in Mexico City. "After my experience here I have come to support more illegal immigration. At the end of the day I would imagine most illegals have good intentions, working to support their family, wanting a new life," she says. "I don't think we should make it so hard for people to get that. Isn't that what America is all about anyway, freedom?"